Now that we have planned all of the enemy paths, it is time to begin planning Missions for enemy hierarchies. If an enemy hierarchy, based on the situation, may execute more than one Mission, we must plan multiple Missions for the hierarchy. 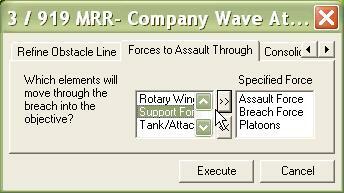 After each Mission is planned, we will cancel the Mission, so that it is not executed until the proper trigger is met. 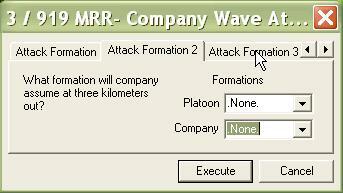 The Company Wave Attack Mission is much like the friendly Company Attack to Breach Mission, except that the enemy, as it gets closer to its objective, will spread out into wider and wider formations. 1. 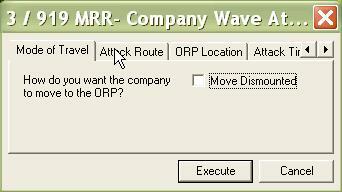 Right-click on the hierarchy for which you wish to plan the mission. 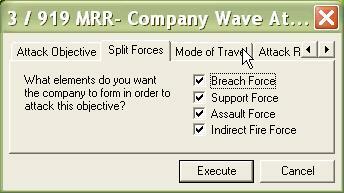 Select 'Company Wave Attack to Breach' from the 'Mission' sub-menu. 2. 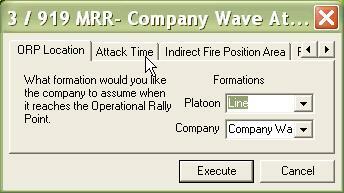 Drag-click over the region on the ground which represents the objective for the attack. Select 'OK'. 3. 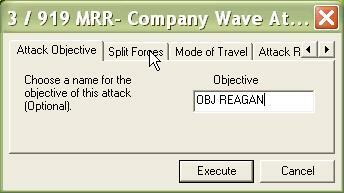 You can enter an objective or leave it blank. It will make no difference to game play. It can help you remember where the objective is, though. 4. 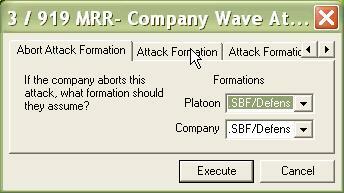 If you un-check one of these boxes, it will cause the hierarchy to 'skip a step' in the attack, such as not forming a Support By Fire (SBF) position or not conducting a breach. 5. 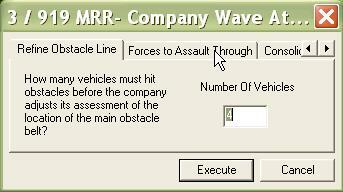 If the hierarchy has dismounts and this box is checked, the unit's dismounts will walk from their current location to the attack's Operational Rally Point (ORP). 6. 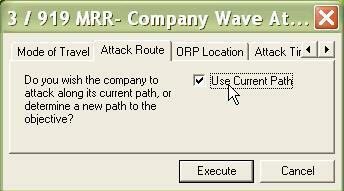 Check this box to tell the hierarchy to use its currently planned path (rather than planning its own path) to the Operational Rally Point. 7. In this order, the 'Platoon' entry is ignored. 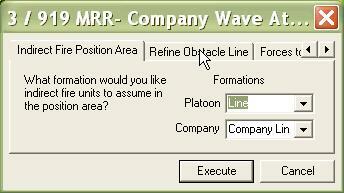 The 'Company' entry tells the unit what formation to assume when it gets to the Rally Point. 8. 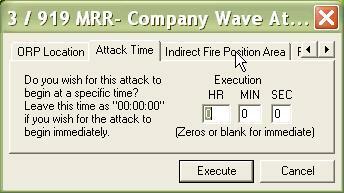 Placing a time in this block will cause the hierarchy to delay before executing the attack. 9. 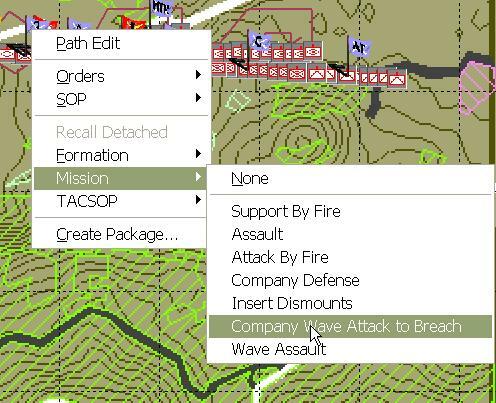 If the hierarchy has mortars or other indirect fire assets attached, this order will tell them what formation to assume when they reach their firing position. 10. The ATF AI will make an initial estimate of where the obstacles are. When the hierarchy hits the number of obstacle strikes indicated here, it will recalculate the assumed obstacle locations based on new evidence. 11. The only valid forces here are 'Assault', 'Breach', and 'Support Force'. The indicated elements will assault through the breach once it is cut. 12. 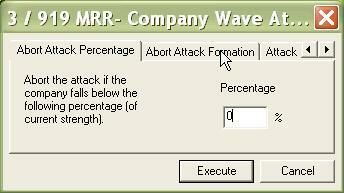 The hierarchy will abort the attack if its forces fall below the given percentage. A zero means the hierarchy will continue until every vehicle is dead. 13. If the hierarchy does abort, this is the formation it will assume. 14. 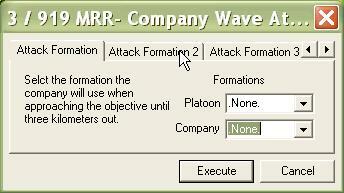 This is the initial formation the unit will use when it initiates the attack. All of these formations are set to '.None.' in this example because of the severely restricted terrain. 16. 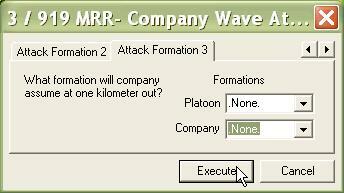 ...And the final formation before the ORP.